Tweed jackets, lady like blouses, bows, silky turbans, lots of floral and lets not forget the sheer. 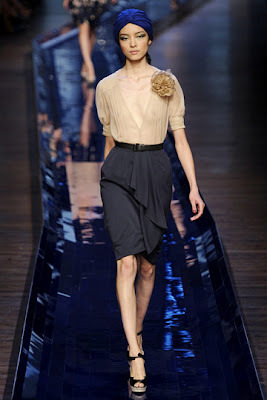 That's what Jason Wu's Spring RTW 2011 collection is all about. Jason Wu's new collection, keeps it elegant yet young with a mix of schoolgirl gone masculine with some simple feminine elegance as they bring the Prada Spring 2007 RTW turban's trend back.